When I was little, I firmly believed that clouds tasted like cotton candy. 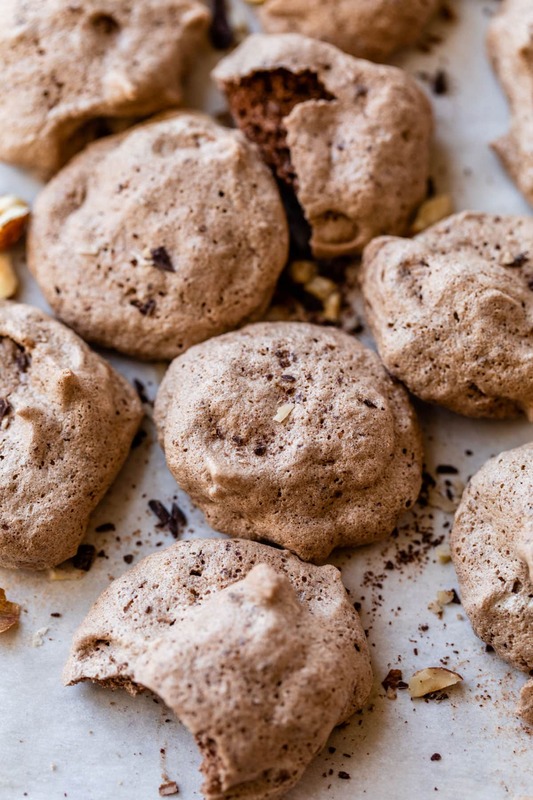 Now that I’m a learned adult, I know better—they taste like Hazelnut Latte Chocolate Meringue Cookies. Impossibly airy, lightly crispy on the outside, and chewy on the inside, meringue cookies are a classic French confection with which I become intimately acquainted while studying abroad in France. Meringue cookies are also probably the one major French contribution to the world of pastry that doesn’t involve copious amounts of butter, a fact which prompted me to avoid them for my first few weeks abroad. A French dessert with no butter or cream? Surely meringues must be a mistake. Meringue cookies would be the first of many misconceptions I corrected while abroad. Another is the idea that overnight trains are adventurous and romantic, but that’s a story for another time. I’d like to tell you that I discovered I loved meringue cookies when a dark and handsome Frenchman presented me with a basket of them beneath the Eiffel Tower, then told me how beautiful I am. The less-than-cute truth: I tried meringues because I was low on Euros, and they are one of the least pastries in the case. It turns out, meringues are the best deal in France! After one bite, I was smitten these sweet, ethereally light treats. In place of typical baking standbys flour, baking powder, and butter, meringue cookies are comprised of eggs whites whipped into a fluffy frenzy, sugar, and the flavorings of your choice. (For today’s Hazelnut Latte Chocolate Meringue Cookies, that’s ground hazelnuts, espresso, and bittersweet chocolate). The batter becomes a glorious shine that any hair model would envy, is scooped or piped onto a baking sheet, then baked low and slow. The result is a confection that is delicate and crispy on the outside and melt-in-your-mouth soft and chewy on the inside. Meringue cookies fascinate me to no end, mostly because I still cannot get over the miracle of egg whites. What begins as a clear goop is transformed to stiff glossy peaks that we build into a delightful dessert. No wonder I associate meringues with clouds—they are miraculous! 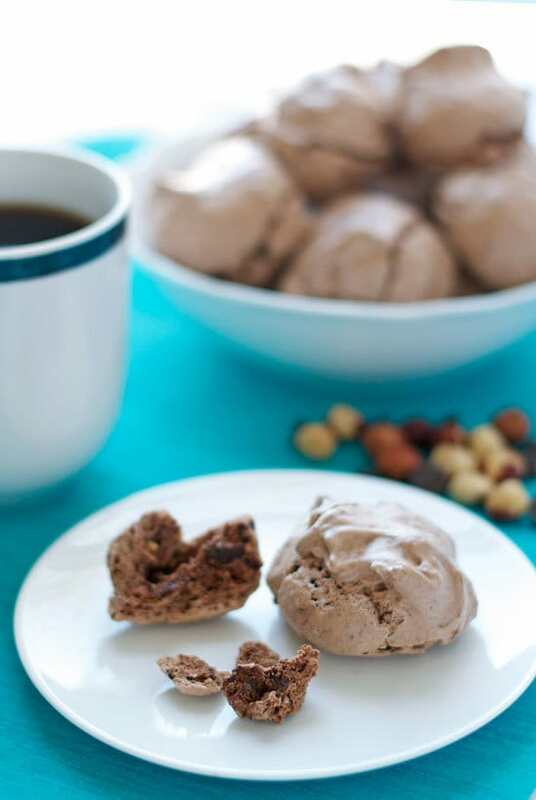 Hazelnut Latte Chocolate Meringue Cookies combine three of my favorite flavors: complex and toasty hazelnuts, deep espresso, and the darkest chocolate. 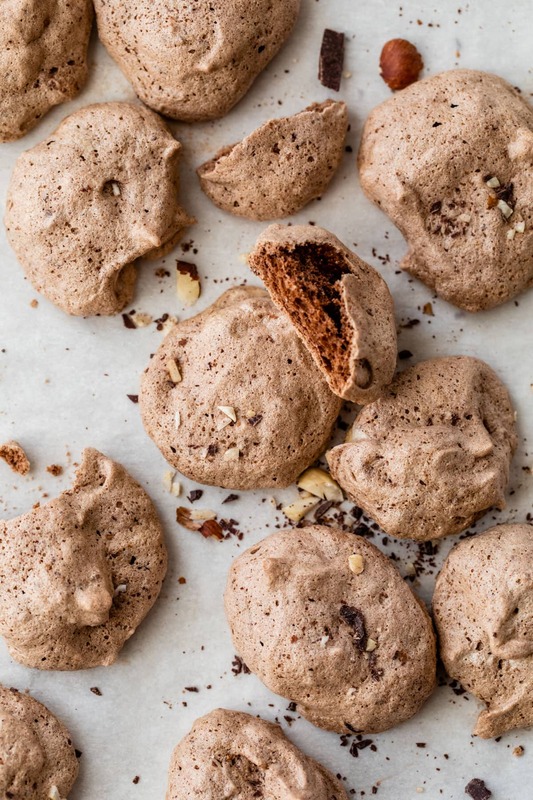 Classic meringue cookies are made with only sugar and egg white and can sometimes be excessively sweet, even for even my sugar-loving teeth, but the addition dark chocolate, hazelnuts, and coffee temper the sweetness perfectly, to the point of danger. 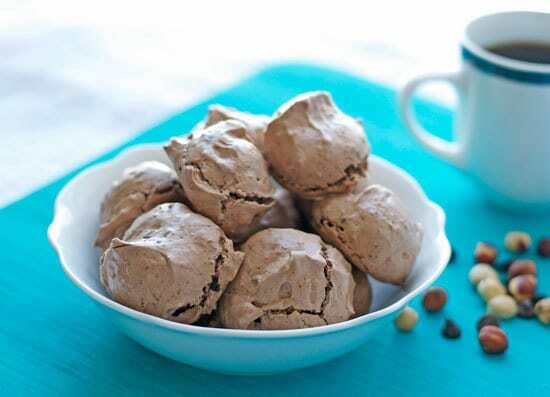 Hazelnut Latte Chocolate Meringue Cookies are so airy and their taste so well balanced the entire plates have a mysterious habit of disappearing. 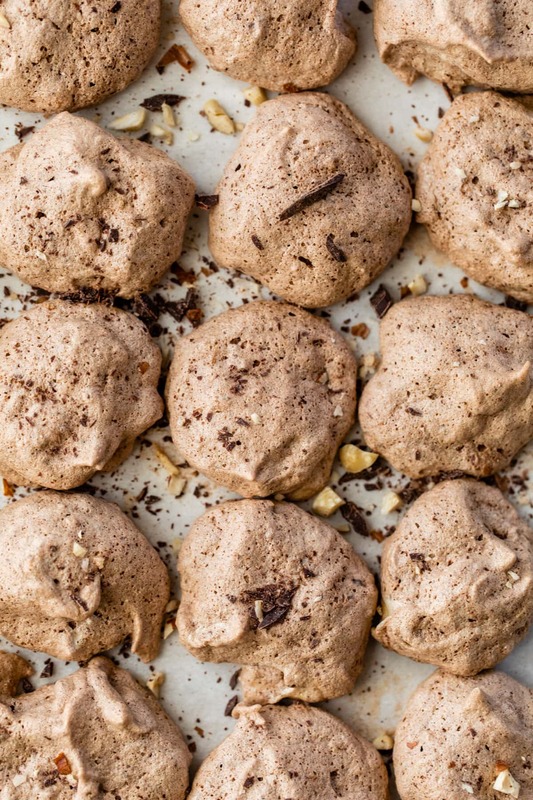 If you are feeling fancy-schmancy, you can pipe Hazelnut Latte Chocolate Meringue Cookies into pretty shapes, but I personally love the simplicity of spooning the batter with a baby ice cream scoop. The meringues crackle as they bake, making them extra satisfying to pull apart and munch. 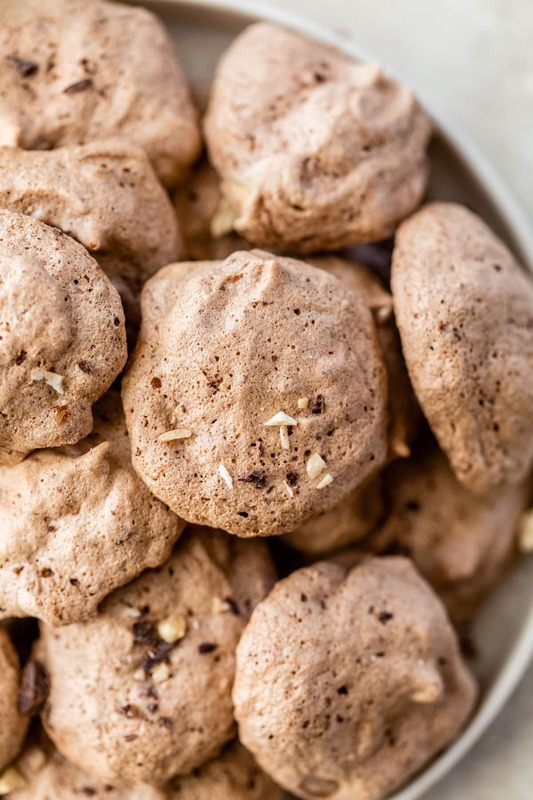 Grab yourself a plate of Hazelnut Latte Chocolate Meringue Cookies and prepare to be carried away to the clouds with your first bite. Eiffel Tower and attractive Frenchman are recommended, but optional. 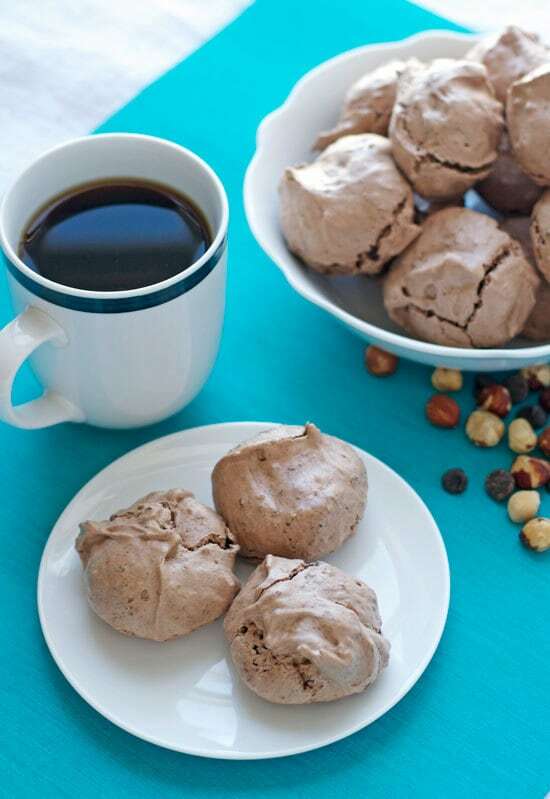 Hazelnut Mocha Meringue Cookies are baked with hazelnuts, espresso and dark chocolate. These dreamy cookies are loaded with flavor but taste lighter than air! Place the oven racks in the upper and lower third positions. Preheat oven to 300°F. Line two large baking sheets with parchment paper or a silpat mat and set aside. In the bowl of a food processor (mini if possible), combine the hazelnuts, chocolate, and espresso powder. Pulse until finely ground. Set aside. In a medium bowl, sift together the powdered sugar and cocoa powder. Set aside. In a stand mixer with the whisk attachment or a large mixing bowl, whip the egg whites and salt on medium speed, until the whites are no longer clear. (Ensure your mixing bowl is perfectly clean and dry, or the whites will not whip properly.) Increase the speed to medium-high and continue to whip, adding the granulated sugar 1 tablespoon at a time as you go. Continue whipping until the whites are firm and hold stiff peaks. They should be very shiny. Beat in the vanilla extract. With a large rubber spatula, gently and quickly fold in the powdered sugar mixture, until most streaks are gone, trying to deflate the egg whites as little as possible. Lightly fold in the chocolate-hazelnut mixture, just until combined. With a small ice cream scoop, drop the meringues by rounded tablespoons 2 inches apart on the prepared baking sheets. Bake for 10 minutes, then without opening the oven door, reduce oven temperature to 200 degrees F and continue baking for 1 additional hour. Remove the baking sheets from the oven, then let the meringues stand at room temperature on the baking sheets. Carefully pull off the meringues off of the baking sheet and serve. Store any leftovers in an airtight container at room temperature. So how do we get the recipe? When I click on the link I get a message that it doesn’t exist…..thanks! Hi Cynthia! I’m so sorry about that! It looks like the recipe didn’t publish on FF’s website as early as expected. I’ll follow up with them, but in the meantime, added it here. Thank you SO MUCH for letting me know!!! I appreciate it. I love delicate, light meringue cookies and this is a great flavour combo! Ohhh meringue! Yet another thing that I haven’t tried to make..but adore eating! I’ve never had a chocolate meringue, just the usual white ones…but chocolate makes everything better. Especially with hazelnut and coffee. Maybe I’ll just have the whole batch instead of my morning pot ‘o joe. Good life plan. Heading to get the recipe and pinning! I love meringues. Making them with chocolate and hazelnut makes them even better. Pinning! I love meringue cookies!! The flavor possibilities are just endless. Hazelnut and chocolate and espresso….sounds amazing!! And I’ll keep the version of the story that a tall dark handsome French boy presented these to you!! YUM!!!! So love the flavor combo of these meringues! Totally unique! I don’t think I’ve ever had a hazelnut latte chocolate meringue before! You had me at meringue….and hazelnut….and espresso!! These cookies are pure perfection! Totally digging this recipe, Erin. I have never made meringue cookies but love eating the vanilla ones from Trader Joes. I’m assuming this is no comparison, homemade are probably 100 times better because homemade things always are! This flavor combination sounds lovely. Thanks for sharing! Meringues are so great when you’re trying to watch your calories! Aka, right now as swim suit season is coming up. Eek! And that is amazing you got to study abroad in France! Dude, totally love meringue cookies!!! And this latte version? Forget.about.it. Wow, I bet the texture of these are fabulous! And chocolate + hazelnut is the BEST combo. Love meringue cookies! These look perfectly light and airy! I want this so badly it hurts! Ooooh, can’t wait to try these! I love meringues…they have been a standby for me when I need a treat but don’t want to get off track with healthy eating. The texture makes up for the lack of butter and flour! I could not have said it better myself!! Thanks so much Leah Joy. I’ve always really loved meringue cookies. So yummy! Kammie, you are ahead of the game! I only discovered them in college and I wish I would’ve known earlier. They are a too well kept secret of the cookie world! They look really light and beautiful! what a wonderful batch of cookies!! Meringues are so simple and so good! i don’t know why i never make them. yum. Sarah, as soon as I made these, I had to ask myself: why don’t I make them every week??? Simple and good is the way to go! This just made me realize that I’ve never made homemade meringue cookies and I need to fix that asap. Or go to France. :) These look lovely, Erin! Love the flavor combos you used! Beautiful pictures! This looks so amazing. I’ll take the cookies and the frenchman, please! I studied in France too, Erin! But now I’m disappointed that I didn’t discover these meringues while I was there! These look absolutely beautiful, and what a wonderful combination of flavours! Perfect pinning material! I need meringues. And hazelnut lattes. And a plane ticket to France. These look perfect!!! I haven’t made meringues in forever! I’m hazelnut latte obsessed (please ask the barista at the coffee shop down the street for proof) so these are a must-make. Pinned! Just ordered hazelnut latte the last time I was at Starbucks myself! Sounds like you have great taste ;-) Seriously though, thanks so much! I’m totally digging the flavor trifecta! These sound great! Sandwich two of them together with some ganache in the middle and boom, mind blown! just made a batch, they turned out awesome, terrific flavor punch, crispy and melting outside and a chewy, almost nougat interior. I’m so glad you enjoyed them, Ed! Thanks for sharing this awesome review!